(Seychelles News Agency 10th August 2014) – It’s the first conservation success story of its kind in the world: the Seychelles warbler (Acrocephalus sechellensis) was one of the most threatened bird species in the world in the 1960s – down to a total population of only 26 birds, conservation experts had to move fast to avert the birds from becoming entirely extinct. After decades of ongoing habitat rehabilitation on the last remaining island where the birds were found in the wild, the warbler’s future looks a lot brighter, thanks to efforts by local NGO Nature Seychelles, a Birdlife International partner. With the total population now in the thousands, the organisation captured 59 birds from Cousin Island and transferred them by helicopter to the private resort island of Frégate in the Seychelles in December 2011, which is now the fifth island where these birds live. According to a new study published in Conservation Evidence this month, the birds have increased to over 80 individuals, including 42 birds hatched on Frégate, after a census was carried out on the island in June last year. The project was funded by an $18,000 Disney Worldwide Conservation Fund grant to Nature Seychelles through the Royal Society for the Protection of Birds (BirdLife International’s UK arm), the Seychelles Warbler Research Group (a collaboration between the Universities of East Anglia and Sheffield in the UK, and the University of Groningen, Netherlands) and Frégate Island Private. In an email interview with SNA, Nirmal Shah, the CEO of Nature Seychelles said the vision of establishing the birds on five islands in the Seychelles has finally been realised. Currently, the birds are established on Cousin, Cousine, Aride, Denis and now Frégate. “It was a vision that was thought to be achievable within a certain time frame, taking into consideration the few islands that could become suitable for the warbler,” he said. The fifth island went through a painstaking selection process, and Shah explained why Frégate was finally selected over other private islands such as D’Arros and North Island. The endangered birds need an undisturbed indigenous forest environment that is completely free from predatory mammals, such as rats and cats, which are all by-products of human settlement. 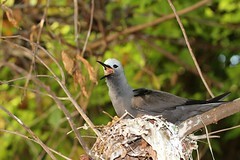 For this reason, Shah explained that inhabited islands such as Mahé, Praslin or La Digue could never be a home to the Seychelles warbler. Shah added that North Island now needed a new assessment for consideration on new projects. As for the road ahead, Shah has good reason to hope that their efforts will be recognised as an official miracle.